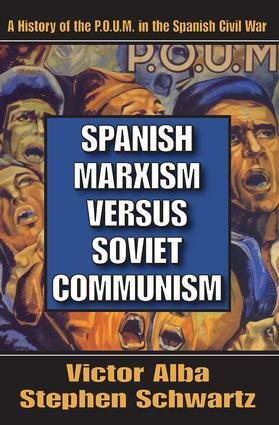 Spanish Marxism Versus Soviet Communism is the first historical study of the P.O.U.M. to appear in English. Drawing from his multi-volume work on the subject, which was published in Spanish and Catalan, Victor Alba has collaborated with Stephen Schwartz to produce a condensed and amplified study that is far more than a translation.Outside Spain, the political movement known as the Workers Party of Marxist Unification (Partido Obrero de Unificacion Marxist or P.O.U.M.) is chiefly known as the revolutionary group with which George Orwell fought during the Spanish Civil War of the 1930s. The events in which the P.O.U.M. found itself at the center of conflict between Iberian revolutionaries and Soviet interests remain a controversial topic for historians and other writers. This book presents a detailed picture of the organization and its main antecedent, the Workers' and Peasants' Bloc, in the context of a stimulating working class political culture.Those interested in Catalan history as well as historians of Western European Marxism and the Spanish Civil War will find this book useful. It will also be of interest to those concerned with Orwell and his experience in Spain. A fitting tribute to the P.O.U.M. 's great struggle against Stalinism, Spanish Marxism Versus Soviet Communism will surely stand out among the array of books that have been published on the Spanish Civil War period as a definitive study. The Formation of the P.O.U.M. Orwell and Others: Foreigners and the P.O.U.M.